If the concept of timeless can be defined in a creation in which form and function combine with such perfection as to defy the passage of time, then perhaps the Suzuki Jimny LJ is one of these. Although advancements in the field of automotive technology since the early 70's have added comfort and power to vehicles of all types, including off-roaders, the basic tenets of off-roading: power-to-weight ratio, ground clearance, maneuverability and durability remain unchanged. 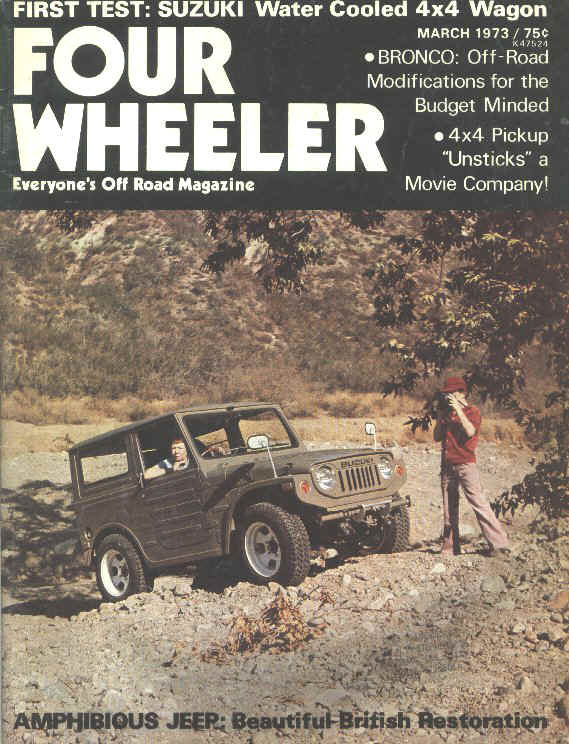 It was with these fundamentals in mind that the LJ was designed in 1969, and the healthy population of original LJ's still on road and trail three decades later is evidence that not only is it one of the most versatile and enjoyable machines ever produced, it is also among the most rugged. Although the Jimny is not fast (top speed is a leisurely 50 mph) it has a nearly uncanny ability to go where many others cannot; its diminutive size and lightweight 360 cc engine combine to form a nimble package that easily negotiates the challenges of almost any trail. The LJ may not immediately appear a serious alternative for some, with its minuscule power plant and limited seating and cargo capacity, but it is definitely a serious contender off-road. Easy towing overcomes the Jimny's inherent speed limitation, thanks to an optional easily removable tow bar. Once away from the pavement the LJ takes readily to all types of terrain; stock 16" Bridgestone's provide plenty of traction and help boost ground clearance to a healthy 9.5 inches, providing plenty of room to clear most rocks and logs and get across shallow rivers with ease. It should be noted that the van models are somewhat top heavy, so caution should be taken when negotiating sharp, steep bends. 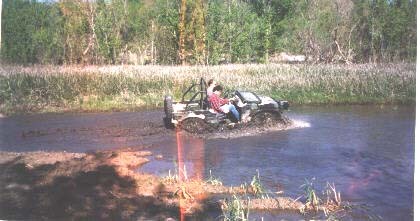 Otherwise, the LJ is very stable off-road, requiring relatively moderate driver input to stay on track. A four-speed manual transmission and two-speed transfer case smoothly convey the two-stroke engine's thirty-two horsepower to two or four wheels. An often unmentioned plus is the parking brake, mounted aft of the transfer case, which locks the rear drive shaft and thus all four wheels when four wheel drive is engaged-good for piece of mind when parking on steep slopes. Instrumentation and controls are simple: speedometer, temperature and fuel gauges, turn signals and a low oil warning light are standard; an ashtray, manually-activated window washer pump bulb, manual choke and small glove box complete the dashboard layout. Fuel capacity is seven gallons, giving the LJ a range of over 200 miles. 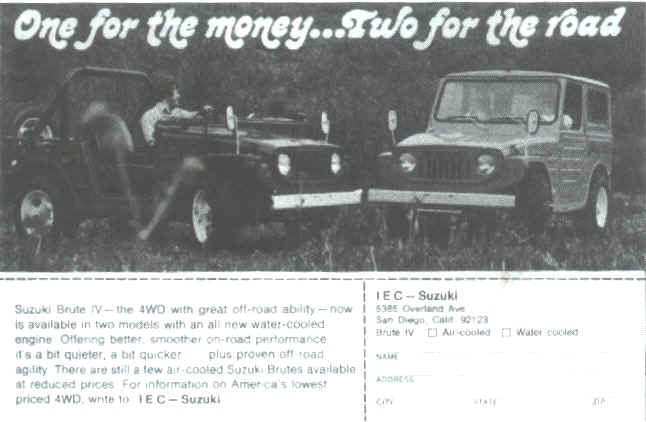 The oil supply for the Suzuki CCIS automatic oil injection system is easily replenished by filling a two-quart tank under the hood, a reserve that will last through several tanks of gasoline. Other points of regular maintenance, such as the components of the standard ignition system, fuel filter and air cleaner element are easily accessed. Frequent application of a grease gun is required at points along the driveline and steering mechanism, while lubrication of the front axle joints, gearbox and differential should also be performed often. If you are not yet a Jimny owner and have read this far than this is for you, who may well have become beguiled by the charms of the "Little Jeep", and perhaps are wondering if it may be the one for you. Beware, the LJ will ask you to get your hands dirty, from time to time; as with any vehicle approaching the status of "classic" it requires extra effort, care and patience be devoted to maintenance and general upkeep. 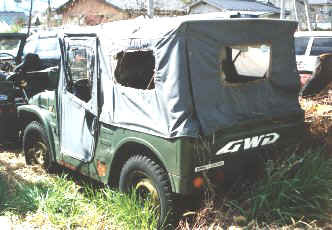 What this little Suzuki provides in return for this extra commitment, perhaps more than any other, is the capacity to take the off-roader to heretofore unexplored regions, whether they be in mountain or valley, sand or snow, wetland or dry, and to impart a sense of joyful freedom to the entire experience. The Suzuki Jimny LJ is to the trail what the Piper Cub is to the air, a two-seat machine with functionality that somehow transcends the sum of its parts, despite its limitations capable of opening new horizons for those wishing to take a chance on something different.